Potential clues to how autism miswires the brain are emerging from a study of a rare, purely genetic form of the disorders that affects fewer than 20 people worldwide. Using cutting-edge "disease-in a-dish" technology, researchers funded by the National Institutes of Health have grown patients' skin cells into neurons to discover what goes wrong in the brain in Timothy Syndrome. Affected children often show symptoms of autism spectrum disorders along with a constellation of physical problems. Abnormalities included changes in the composition of cells in the cortex, the largest brain structure in humans, and of neurons that secrete two key chemical messengers. Neurons that make long-distance connections between the brain's hemispheres tended to be in short supply. "Studying the consequences of a single mutation, compared to multiple genes with small effects, vastly simplifies the task of pinpointing causal mechanisms," explained Ricardo Dolmetsch, Ph.D., of Stanford University, a National Institute of Mental Health (NIMH) grantee who led the study. His work was partially funded by a NIH Director's Pioneer Award. "Unlike animal research, the cutting-edge technology employed in this study makes it possible to pinpoint molecular defects in a patient's own brain cells," said NIMH Director Thomas R. Insel, M.D..
"It also offers a way to screen more rapidly for medications that act on the disordered process." Prior to the current study, researchers knew that Timothy syndrome is caused by a tiny glitch in the gene that code for a calcium channel protein in cell membranes. The mutation results in too much calcium entering cells, causing a tell-tale set of abnormalities throughout the body. Proper functioning of the calcium channel is known to be particularly critical for proper heart rhythm – many patients die in childhood of arrhythmias – but its role in brain cells was less well understood. "Remarkable reproducibility" observed across multiple iPSC lines and individuals confirmed that the technique can reveal defects in neuronal differentiation – such as whether cells assume the correct identity as the brain gets wired-up in early development, said the researchers. 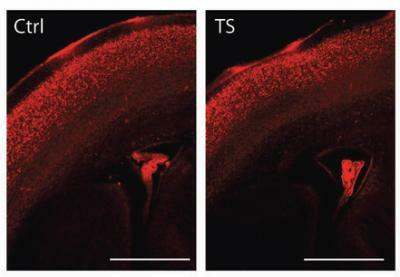 Compared to those from controls, fewer neurons from Timothy Syndrome patients became neurons of the lower layers of the cortex and more became upper layer neurons. The lower layer cells that remained were more likely to be the kind that project to areas below the cortex. In contrast, there were fewer-than-normal neurons equipped to form a structure, called the corpus callosum, which makes possible communications between the left and right hemispheres. The findings in Timothy Syndrome patient iPSCs follow those in Rett Syndrome, another single gene disorder that often includes autism-like symptoms. About a year ago, Alysson Muotri, Ph.D., and colleagues at University of California, San Diego, reported deficits in the protrusions of neurons, called spines, which help form connections, or synapses. The Dolmetsch team's discovery of earlier (neuronal fate) and later (altered connectivity) defects suggest that disorders on the autism spectrum affect multiple stages in early brain development. "Most of these abnormalities are consistent with other emerging evidence that ASDs arise from defects in connectivity between cortex areas and show decreased size of the corpus callosum," said Dolmetsch. "Our study reveals how these might be traceable to specific mechanisms set in motion by poor regulation of cellular calcium. It also demonstrates that neurons derived from iPSCs can be used to identify the cellular basis of a neurodevelopmental disorder." Pasca SP, Portmann T, Voineagu I, Yazawa M, Shcheglovitov O, Pasca AM, Cord B, Palmer TD, Chikahisa S, Seiji N, Bernstein JA, Hallmayer J, Geschwind DH, Dolmetsch RE. Researchers at Sweden's KTH Royal Institute of Technology say they have found further proof that the wolf ancestors of today's domesticated dogs can be traced to southern East Asia – findings that run counter to theories placing the cradle of the canine line in the Middle East. Data on genetics, morphology and behaviour show clearly that dogs are descended from wolves, but there's never been scientific consensus on where in the world the domestication process began. "Our analysis of Y-chromosomal DNA now confirms that wolves were first domesticated in Asia south of Yangtze River – we call it the ASY region – in southern China or Southeast Asia", Savolainen says. "Taken together, the two studies provide very strong evidence that dogs originated in the ASY region", Savolainen says. Archaeological data and a genetic study recently published in Nature suggest that dogs originate from the Middle East. But Savolainen rejects that view. "Because none of these studies included samples from the ASY region, evidence from ASY has been overlooked," he says. Approximately half of the gene pool was universally shared everywhere in the world, while only the ASY region had the entire range of genetic diversity. "This shows that gene pools in all other regions of the world most probably originate from the ASY region", Savolainen says. "Our results confirm that Asia south of the Yangtze River was the most important – and probably the only – region for wolf domestication, and that a large number of wolves were domesticated", says Savolainen. "Since other studies have indicated that wolves were domesticated in the Middle East, we wanted to be sure nothing had been missed. We find no signs whatsoever that dogs originated there", says Savolainen. "This subsequent dog/wolf hybridisation contributed only modestly to the dog gene pool", Savolainen explains. University of Central Florida researchers, for the first time, have used stem cells to grow neuromuscular junctions between human muscle cells and human spinal cord cells, the key connectors used by the brain to communicate and control muscles in the body. project for more than a decade. Credit: University of Central Florida. The success at UCF is a critical step in developing "human-on-a-chip" systems. The systems are models that recreate how organs or a series of organs function in the body. Their use could accelerate medical research and drug testing, potentially delivering life-saving breakthroughs much more quickly than the typical 10-year trajectory most drugs take now to get through animal and patient trials. "These types of systems have to be developed if you ever want to get to a human-on-a-chip that recreates human function," said James Hickman, a UCF bioengineer who led the breakthrough research. "It's taken many trials over a number of years to get this to occur using human derived stem cells." Hickman's work, funded through the National Institute of Neurological Disorders and Stroke (NINDS) at the National Institutes of Health, is described in the December issue of Biomaterials. Hickman is excited about the future of his research because several federal agencies recently launched an ambitious plan to jump-start research in "human-on-a-chip" models by making available at least $140 million in grant funding. The National Institutes of Health (NIH), the Defense Advanced Research Projects Agency (DARPA), and the Federal Drug Administration (FDA) are leading the research push. The goal of the call for action is to produce systems that include various miniature organs connected in realistic ways to simulate human body function. This would make it possible, for instance, to test drugs on human cells well before they could safely and ethically be tested on living humans. The technique could potentially be more effective than testing in mice and other animals currently used to screen promising drug candidates and to develop other medical treatments. Such conventional animal testing is not only slow and expensive, but often leads to failures that might be overcome with better testing options. The limitations of conventional testing options have dramatically slowed the emergence of new drugs, Hickman said. 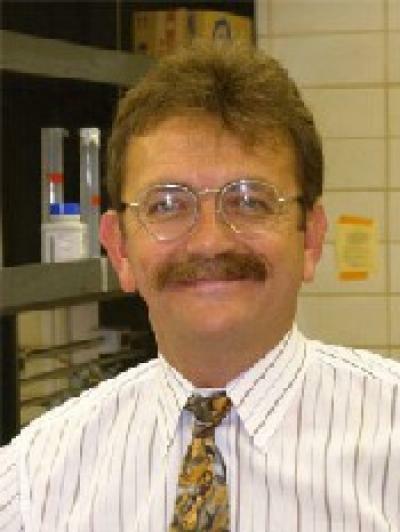 The successful UCF technique began with a collaborator, Brown University Professor Emeritus Herman Vandenburgh, who collected muscle stem cells via biopsy from adult volunteers. Stem cells are cells that can, under the right conditions, grow into specific forms. They can be found among normal cells in adults, as well as in developing fetuses. Nadine Guo, a UCF research professor, conducted a series of experiments and found that numerous conditions had to come together just right to make the muscle and spinal cord cells "happy" enough to join and form working junctions. This meant exploring different concentrations of cells and various timescales, among other parameters, before hitting on the right conditions. "Right now we rely a lot on animal systems for medical research but this is a pure human system," Guo said. "This work proved that, biologically, this is workable." Besides being a key requirement for any complete human-on-a-chip model, such nerve-muscle junctions might themselves prove important research tools. These junctions play key roles in Amyotrophic lateral sclerosis, commonly known as Lou Gehrig's disease, in spinal cord injury, and in other debilitating or life threatening conditions. With further development, the team's techniques could be used to test new drugs or other treatments for these conditions even before more expansive chip-based models are developed. Among the many hurdles to be cleared before human embryonic stem cells can achieve their therapeutic potential is determining whether or not transplanted cells can functionally integrate into target organs or tissues. Writing today (Monday, Nov. 21) in the Proceedings of the National Academy of Sciences, a team of Wisconsin scientists reports that neurons, forged in the lab from blank slate human embryonic stem cells and implanted into the brains of mice, can successfully fuse with the brain's wiring and both send and receive signals. Neurons are specialized, impulse conducting cells that are the most elementary functional unit of the central nervous system. The 100 billion or so neurons in the human brain are constantly sending and receiving the signals that govern everything from walking and talking to thinking. The work represents a crucial step toward deploying customized cells to repair damaged or diseased brains, the most complex human organ. "The big question was can these cells integrate in a functional way," says Jason P. Weick, the lead author of the new study and a staff scientist at the University of Wisconsin-Madison's Waisman Center. "We show for the first time that these transplanted cells can both listen and talk to surrounding neurons of the adult brain." The Wisconsin team tested the ability of their lab grown neurons to integrate into the brain's circuitry by transplanting the cells into the adult mouse hippocampus, a well-studied region of the brain that plays a key role in processing memory and spatial navigation. The capacity of the cells to integrate was observed in live tissue taken from the animals that received the cell transplants. Weick and colleagues also reported that the human neurons adopted the rhythmic firing behavior of many brain cells talking to one another in unison. And, perhaps more importantly, that the human cells could modify the way the neural network behaved. A critical tool that allowed the UW group to answer this question was a new technology known as optogenetics, where light, instead of electric current, is used to stimulate the activity of the neurons. "Previously, we've been limited in how efficiently we could stimulate transplanted cells. Now we have a tool that allows us to specifically stimulate only the transplanted human cells, and lots of them at once in a non-invasive way," says Weick. Weick explains that the capacity to modulate the implanted cells was a necessary step in determining the function of implanted cells because previous technologies were too imprecise and unreliable to accurately determine what transplanted neurons were doing. Embryonic stem cells, and the closely related induced pluripotent stem cells can give rise to all of the 220 types of tissues in the human body, and have been directed in the lab to become many types of cells, including brain cells. The appeal of human embryonic stem cells and induced pluripotent cells is the potential to manufacture limitless supplies of healthy, specialized cells to replace diseased or damaged cells. Brain disorders such as Parkinson's disease and amyotrophic lateral sclerosis, more widely known as Lou Gehrig's disease, are conditions that scientists think may be alleviated by using healthy lab grown cells to replace faulty ones. 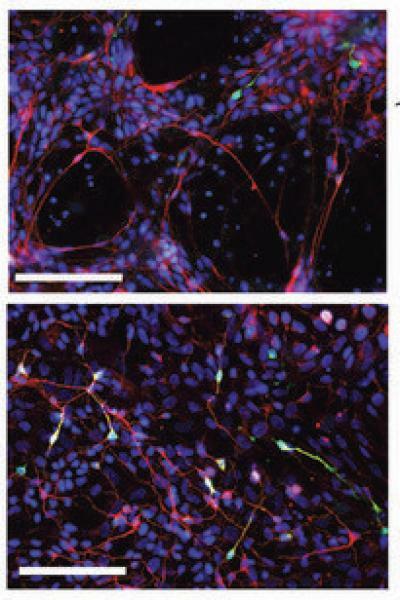 Multiple studies over the past decade have shown that both embryonic stem cells and induced cells can alleviate deficits of these disorders in animal models. The new study opens the door to the potential for clinicians to deploy light-based stimulation technology to manipulate transplanted tissue and cells. "The marriage between stem cells and optogenetics has the potential to assist in the treatment of a number of debilitating neurodegenerative disorders," notes Su-Chun Zhang, a UW-Madison professor of neuroscience and one of the authors of the new PNAS report. "You can imagine that if the transplanted cells don't behave as they should, you could use this system to modulate them using light." A new study in Nature Medicine describes how different types of immune system T-cells alternately discourage and encourage stem cells to regrow bone and tissue, bringing into sharp focus the importance of the transplant recipient's immune system in stem cell regeneration. The study, conducted at the Center for Craniofacial Molecular Biology at the Ostrow School of Dentistry of USC, examined how mice with genetic bone defects responded to infusions of bone marrow mesenchymal stem cells, or BMMSC. Under normal conditions, the mice's T-cells produced an inflammatory response and triggered the creation of cellular proteins interferon (INF)-g and tumor necrosis factor (TNF)-a. These attacked and killed the stem cells, preventing the production of new bone. "Normally, T-cells protect us from infection," said Professor Songtao Shi, corresponding author for the study, "but they can block healthy regeneration from happening." However, when the mice were given infusions of regulatory T-cells, or Treg, the levels of the interfering INF- g and TNF- a decreased, increasing the rate of bone growth and defect repair. Furthermore, administering the anti-inflammatory drug aspirin at the site of the bone defect also increased the rate at which the BMMSCs were able to regrow bone. Postdoctoral Research Associate and lead author Yi Liu said the findings illustrate the previously unrecognized role of T-cells in tissue regeneration. They also highlight the need for scientists exploring the possibilities of stem cell regeneration to shift their focus to the immune system, she added. "Based on what we've found, this should be the direction of more research in the future," Liu said. Researchers from Mount Sinai School of Medicine have discovered the therapeutic benefit of foetal stem cells in helping the maternal heart recover after heart attack or other injury. The research, which marks a significant advancement in cardiac regenerative medicine, was presented today at the American Heart Association's (AHA) Scientific Sessions 2011 in Orlando, Florida, and is also published in the current issue of Circulation Research, a journal of the AHA. In the first study of its kind, the Mount Sinai researchers found that foetal stem cells from the placenta migrate to the heart of the mother and home to the site where an injury, such as a heart attack, occurred. The stem cells then reprogram themselves as beating heart stem cells to aid in its repair. The scientists also mimicked this reprogramming in vitro, showing that the foetal cells became spontaneously beating heart cells in cell culture, which has broad-reaching implications in treating heart disease. Previous studies have documented a phenomenon in which half of women with a type of heart failure called peripartum cardiomyopathy saw their condition spontaneously recover in the months following pregnancy. Based on this evidence, the Mount Sinai team wanted to determine whether foetal stem cells played a role in maternal recovery. They evaluated the hearts of pregnant female mice that underwent mid-gestation heart injury and survived. Using green fluorescent protein in the foetuses to tag the foetal stem cells derived from the placenta, they found that the green fluorescent stem cells homed to the injured hearts of their mothers, grafted onto the damaged tissue, and differentiated into smooth muscle cells, blood vessel cells, or another type of heart cell called cardiomyocytes. "Our research shows that foetal stem cells play an important role in inducing maternal cardiac repair," said Hina Chaudhry, MD, Director of Cardiovascular Regenerative Medicine at Mount Sinai School of Medicine, and principal investigator of the study. "This is an exciting development that has far-reaching therapeutic potential." With a broader understanding of the role of foetal stem cells, Dr. Chaudhry and her team then isolated the foetal cells that had grafted onto the maternal hearts and recreated the environment in vitro. They found that the cells spontaneously differentiated into cardiac cells in cell culture as well. Until now, researchers have had limited success in discovering the regenerative potential of stem cells in heart disease. The use of bone marrow cells in cardiac regeneration has largely failed as well. Dr. Chaudhry's research team has found that foetal cells may potentially be a viable therapeutic agent, both through in vivo and in vitro studies. "Identifying an ideal stem cell type for cardiac regeneration has been a major challenge in heart disease research," said Dr. Chaudhry. "Embryonic stem cells have shown potential but come with ethical concerns. We've shown that foetal stem cells derived from the placenta, which is discarded postpartum, have significant promise. This marks a significant step forward in cardiac regenerative medicine." These findings have implications beyond cardiovascular disease. The foetal stem cells travelled only to the injury site on the damaged heart, and not to other undamaged organs, meaning research on the benefit of these cells on organs damaged by other diseases would be beneficial. Importantly, a significant percentage of the foetal cells isolated from maternal hearts express a protein called Cdx2, which indicates that the cells may not have developed mature immune recognition molecules and therefore are unlikely to cause a negative immune response, which occurs in organ transplant. "Our study shows the promise of these cells beyond just cardiovascular disease," said Dr. Chaudhry. "Additionally, this breakthrough greatly underscores the importance of translational research. As a clinician who also has a basic science laboratory, I am in the unique position to assess the needs of my patients, evaluate how they respond to treatment and recover from illness, and bring that anecdotal knowledge to the experiments in my lab." The results were presented this morning at the 2011 Scientific Sessions of the American Heart Association Meeting in Orlando, Fla. They also will be published online in JAMA to coincide with the presentation. "Some data suggests that stem cell therapy is helpful within the first week after a heart attack," says Robert Simari, M.D., cardiologist at Mayo Clinic and chairman of the Cardiovascular Cell Therapy Research Network (CCTRN). The network includes five clinics and other sites supported by the National Heart, Lung, and Blood Institute, part of the National Institutes of Health. "Our study helps identify the limits of when stem cell therapy might be beneficial. We now know that this therapy should not be extended two to three weeks after a heart attack. While it is safe to do so, we did not find any benefit to heart function after six months." Between July 2008 and February 2011, 87 people with heart attacks and moderate to severe left ventricular dysfunction received their own bone marrow mononuclear stem cells (BMCs) or placebo. The study, called LateTIME, developed a standardized method of processing the BMCs and was the first such trial to provide a uniform dose to each participant. The researchers assessed heart function through a cardiac MRI by measuring the ejection fraction, or what percentage of blood is pumped out of the left ventricle during each contraction. No significant differences were found in the cardiac function readings between baseline and six months in the BMC group (from 48.7 percent to 49.2 percent) or the placebo group (from 45.3 percent to 48.8 percent). Dr. Simari says that earlier studies suggest patients with severe heart attacks benefit most from stem cell therapy. The researchers were interested in studying the two- to three-week period because many people who have severe heart attacks are not well enough or stable enough to receive cells right after their heart attacks. "Many are on life support or other systems, and we didn't think that studying them that early was the best way to assess the benefits to the sickest patients," Dr. Simari says. The LateTIME study offers a cautionary lesson for people who have had heart attacks and are considering going overseas to seek stem cell treatment. "We would suggest that individuals not seek treatment outside of the U.S. for therapies that aren't proven effective," Dr. Simari says. The researchers think that the heart may be less receptive to such therapies two to three weeks after a heart attack, or that a person's stem cells are less potent at that time. Jay Traverse, M.D., lead author of the study and a cardiologist at the Minneapolis Heart Institute at Abbott Northwestern Hospital, says patients will be followed clinically for two years in the LateTIME study. "There may still be other benefits to stem cell therapy that may be uncovered over time," Dr. Traverse says. "We observed that patients who received the cell therapy had fewer adverse events such as placement of defibrillators or repeat revascularization compared to patients who got the placebo, consistent with observations in some of the European trials. This therapy may provide hidden safety measures that reduce adverse events and that's something we will follow closely." LateTIME is one of three heart stem cell trials being conducted by CCTRN. The other trials will explore the effectiveness of stem cell therapy delivered at three days and seven days following a heart attack, and the usefulness of stem cell therapy in people with chronic heart failure. Stem cells obtained from bone marrow, known as BMCs, can be safely injected into people 2-3 weeks following a heart attack, reports a new clinical trial supported by the National, Heart, Lung, and Blood Institute (NHLBI), part of the National Institutes of Health. However, while safe, the BMCs did not improve heart function six months after their administration. This study, called LateTIME (Transplantation in Myocardial Infarction Evaluation), is the first trial to rigorously examine the safety and potential benefits of extending the timing of stem cell delivery to 2-3 weeks following a heart attack. The results will be presented Monday, Nov. 14, at the 2011 Scientific Sessions of the American Heart Association Meeting in Orlando, Fla. They will also appear online in the Journal of the American Medical Association. "Although treatment and survival following a heart attack have improved over the years, the risk of heart failure following a heart attack has not decreased," said Susan B. Shurin, M.D., acting director of the NHLBI. Previous studies have suggested that injecting BMCs into the heart could improve cardiac function following a heart attack and perhaps reduce the need for future hospitalizations and heart surgeries. In contrast to LateTIME, earlier studies delivered BMCs within a few days of the heart attack. In many cases, a patient will not be able to get such immediate treatment, due to poor health following a heart attack or because the hospital providing care doesn't have a stem cell therapy program. Between July 2008 and February 2011, LateTIME enrolled 87 people with heart attacks who had undergone cardiac procedures to open blocked arteries. The participants all had moderate to severe impairment in their left ventricle, which pumps oxygen-rich blood to the body. All the participants had stem cells taken from bone marrow in their hip for processing. LateTIME researchers developed a standardized method of processing and purifying these stem cells, and this was the first BMC trial to provide a uniform dose of BMCs to each participant. The study then randomly assigned the participants to receive either their purified BMCs or inactive (placebo) cells. After six months, improvement of heart function was assessed by measuring the percentage of blood that gets pumped out of the left ventricle during each contraction (left-ventricular ejection fraction, or LVEF) by cardiac MRI. There were no significant differences between the change in LVEF readings between baseline and six months in the BMC (from 48.7 percent to 49.2 percent) or placebo (from 45.3 percent to 48.8 percent) groups. "This does not mean that stem cell therapy will only work if done immediately following a heart attack or that later beneficial effects on clinical outcomes won't emerge," noted Lemuel A. Moyé, M.D., Ph.D., professor of biostatistics at the University of Texas School of Public Health, Houston, and a LateTIME researcher. "Many factors influence how the heart responds to stem cells, which highlights the critical need to continue rigorous tracking studies in this area." Moyé added that the health of the study participants will continue to be evaluated for two years, so the BMC therapy may yet demonstrate health benefits such as a lower risk of subsequent heart attacks or heart failure, in which the heart cannot pump enough blood to meet the body's needs. LateTIME is one of three heart stem cell trials being undertaken by the NHLBI-sponsored Cardiovascular Cell Therapy Research Network. The other trials under way by this multicentre consortium are TIME, which is comparing the effectiveness of stem cell therapy delivered at three days versus seven days following a heart attack, and FOCUS, which is examining stem cell therapy in people with chronic heart failure.